We'd love for you to comment about your thoughts on the eBook below. Gr8 idea! Thanks for the invite! 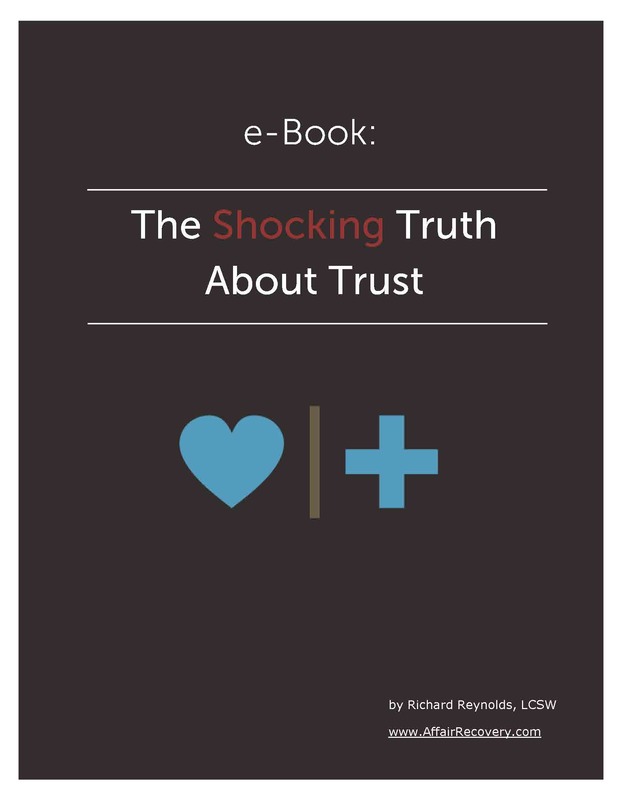 My husband and I are taking full advantage of this ebook to mend our broken relationship and to learn to trust and love each other again. Thank you for this booklet. Each time I read it I gain new insights. My partner chose the button for "half-hearted effort" and the relationship failed 2 years 3 months post discovery. He said all the right words but didn't follow through with his promises. Unfortunately it's a pattern he exhibited in prior relationships but I was foolish enough to think it would be different with me. Now I'm left with healing from both his infidelities and abandonment. Pages 12 & 13 about safety, mistrust, and trust really hit home, especially if I'm ever to have a healthy relationship in the future. I agree that I always gain new insight after reading this article. Before we attended EMS and had the help and support from AR, I felt very isolated and confused. I didn't realize that what was lacking in our relationship post D-day was safety. My spouse was falling victim to all the "typical" unfaithful responses. He was ambivalent about his feelings, defensive to me, and not all in. He would say he wanted to try and make our marriage work but I never truly bought into it. I always felt this enormous sense of dread hanging over us. After our weekend at EMS things started to change. The lightbulb came on for my spouse and he immediately started to follow the steps that created a feeling of safety for me during our recovery. We still have good days/bad days, but for the most part I once again feel safe in the relationship. My anxiety on a daily basis is manageable and I no longer feel uncertain about our ability to move forward. Understanding the concept of safety in the recovery process has definitely been a key for us and is allowing me to restore my trust in my spouse and our marriage. Thank you for helping us both understand the steps needed to build a stronger foundation moving forward. Just one small edit Page 6, last paragraph, need to add and s to the word section - "This document has three section(s)". I was involved in an affair that lasted almost two years. Not a day goes by that I don't regret my actions and how it hurt my wife and could have cost me my children. I have been extremely transparent with my wife concerning the details of the other relationship since the discovery. Some days i struggle to understand how it benefits my wife to know so many details. I trust that it is the only way for her to see that despite my faults I am still the honest man she has always known me to be. I will not stop trying. I was interested in signing up for your online course, but they are all full. My husband and I are in need of thg his to help us with rebuilding and healing our marriage. Our marriage is heading to 19 years, and an ex girlfriend reconnected with him in June 2017. It has been difficult to convince him that this has been an emotional affair, he just doesn't see what he is doing by continuing this friendship is hurting our healing. I never caught them doing anything, he has done certain behaviors that have crossed the friendship line. We are in Marriage and Individual couseling. We are just begun, but I am willing to do whatever it takes to see this through. I had an affair that lingered 4 1/2 years because I got involved after my husband told me he was miserable 8 weeks into our marriage. This was on top of my ex spouse of 22 years(16 being married) passed away unexpectedly 3 weeks after our marriage with bizarre circumstances attached that consumed me, my youngest daughter was wanting to be with her dad and saying she was going to commit suicide just did not know how at 11 years old, we were not handling financial communication well. We did not have a whole lot of money. It was a perfect storm of emotional distress on my part. I cried by myself in an aisle at work and a married man that is a womanizer played on my emotions. Once I was with him the first time, I felt guilty and stuck in an affair I did not want to be in. We were together at first about 10 times and then over the course of 4 years about 2 -3 x a year. We stopped talking for about a year in between even. I never texted or called him. I was always wanting to be with my family. My husband found out last year. We stayed together last year and chose us about 2 months later. It has been 9 months and he said he cannot work through this. He wants us out by June. I have 2 teenagers. Neither are his. I love him and felt like last year I could be the wife I wanted to be before all of the chaos in my life.What do I do? We have been married 28 years. I found out about his affair almost 2 Years ago but the pain and anger still feel as though I found out today. We’ve been to marriage counseling it it’s not helping. I think we both want the marriage to work but I don’t want to live with someone I don’t know if I’ll ever trust again. I feel as though my entire life has been one big lie. I know we need trauma help but can’t seem to find anything. We can’t afford the programs you offer so we are at an impass. Please guide us to what to do before we both crumble.